13 models available, from 25 bar to 1.300 bar. WAP models with cast iron or mid steel frame. WIP models with stainless steel frame. Are used by the Chemical industry or when aggressive liquids are used. WAP0025, WAP0045, WAP0050 and WAP0100 pumps are supplied with double control valve. 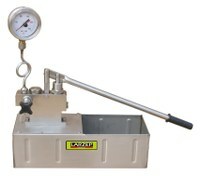 The system, tank or pipe to be tested, should be completely full of liquid and without any leak before connecting the pump to start the testing. Never use the pump to pre-load or fill the system to test. Pressure gauge: Dual scale bar / psi. Pressure gauge: Class 1.6 up to 200 bar and Class 1.0 from 300 to 1.300 bar. Manufactured in cast iron for heavy duty and professional uses. Supplied with pressure gauge ø60 and double control valve, except model WAP0035 that is supplied with single control valve. Hand pumps used for high pressure hydrostatic tests. 2 stages pumps with 100 litres tank manufactured in mid steel. Supplied with pressure gauge ø100 and control valve. 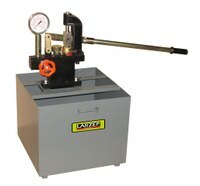 Lightweight hand pumps manufactured in mid steel and stainless steel for use on bench in workshop hydrostatic tests. Supplied with pressure gauge ø60, control valve and 13 litres rectangular tank. WIP0040 and WIP0200 models have stainless steel tanks. WAP0040 and WIP0040 pumps are supplied with 1.5 metre hose. These pumps are normally used by the plumbing for test of the heating plants.